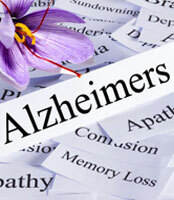 Recent studies show that saffron may play a valuable role in delaying mental decline in cases of Alzheimer’s disease. Dating back perhaps as far as 4,000 years. The spice shows up in the early medicinal texts of India and the Middle-East, where it has long been employed, and has as many as 90 medicinal uses, including the treatment of arthritis, asthma, coughs, colds, liver disorders, poor eyesight and skin problems. Two studies, one published in the Journal of Clinical Pharmacology and Therapeutics, and the other published in the journal Psychopharmacology, show that saffron can help sufferers of mild to moderate Alzheimer’s disease to maintain better overall mental function. Using standard tests for cognitive function, researchers were able to show that the use of saffron provides benefits to Alzheimer’s patients, and that those who took the saffron fared better mentally than those who did not. In one study, the activity of saffron was compared with donepezil (trade name Aricept), a drug used to treat dementia. The two demonstrated comparable effectiveness, with less vomiting among patients in the saffron group. Saffron is rich in antioxidant compounds, including zeaxanthin, which is beneficial to the eyes, and lycopene, which is known to protect the prostate gland. The spice contains compounds that protect nerves, and is rich in gallic acid, a potent compound that is antioxidant and anti-inflammatory, and demonstrates liver-protective, cancer-inhibiting and immune-supporting activity. Saffron also contains pyrogallal, another protective compound that has also been used industrially for a long time to develop photographic film. Needless to say, there are many uses of compounds from plants. Researchers in the two published studies postulate that saffron may help to reduce the formation of beta-amyloid plaque, a sticky substance that builds up in the brain stem and which occurs as part of the development of Alzheimer’s disease. We have seen such activity with another spice, turmeric, which is also a yellow dye. In studies of a primary ingredient in turmeric called curcumin, researchers have found that the development of beta-amyloid plaque can be inhibited. Alzheimer’s disease is devastating in its effects, robbing sufferers of their minds, causing them to forget their loved ones, and leaving them incapable of maintaining any sort of a normal, healthy life. Studies in recent years suggest that traditional spices including saffron and turmeric may play roles in inhibiting the formation of Alzheimer’s, and lessening cognitive decline in the early stages of the disease. This certainly does not mean that either spice is a cure for the disease. But it is entirely possible that including both spices in one’s diet can reduce the risk of developing Alzheimer’s. And the recent studies do show that saffron can help in the early stages of the disease. Thanks to modern scientific research, we have corroboration that traditional remedies often possess the healing properties for which they have been used since antiquity. And sometimes, as in the case of saffron, we also learn new uses of old spices. There is more work to be done with saffron and its uses in the treatment of Alzheimer’s, but the initial signs are positive. According to the two studies cited here, a simple, brightly-colored spice may hold hope for sufferer’s of a devastating disease. Chris Kilham is a medicine hunter (click here) who researches natural remedies all over the world, from the Amazon to Siberia. He teaches ethnobotany at the University of Massachusetts Amherst, where he is Explorer in Residence.